Sooner or later, every pooch owner experiences it: the dreaded wet dog smell. While it’s a natural part of being a doggy parent, it’s not exactly the most exciting aspect of owning a four-legged BFF. However, you can make your dog smell better with a few tips on how to get rid of or even prevent the wet dog smell. Think one towel will be enough at bath time? Think again. Your dog’s coat may be highly resistant to drying out, which means you’ll have to do your best to sop up all the moisture you can. Start at your canine’s head and work your way to the torso, legs, paws and tail. Be sure not to rub too hard, but definitely put allowable amounts of pressure on the fur. Your goal should be to hand-dry using as many towels as you need, so be sure you have some on hand that are thirsty. Yes, you can use a hand blow dryer on your pet, but you have to be very careful. Hold it well enough away so you don’t burn the skin, and always keep everything on low. Be sure to judge how your dog feels about the process, of course. Many are scared of blow dryers. If this is the case, you might want to head to a DIY dog grooming and washing location. The dryers there are meant for pooches and could seem less threatening and more pampering. If it’s a nice day outside, why not finish out a bath with a good, old walk? As long as it’s not too chilly for your pet, you’ll both get the advantage of some exercise while decreasing the likelihood of the clingy, wet dog smell. Too cold to consider taking your pup for a spin around the neighborhood? Play indoors, but don’t allow your pet to just get into his kennel or sink into the couch until he’s dry. No, this doesn’t make your pet dry faster, but it can help neutralize bad odors coming from a drying doggy. Never use sprays intended for anything but dogs, of course! These can be found online, through your veterinarian or at a trusted pet shop. Be sure to read the reviews before trying this method, and be alert for any allergic reactions on your dog’s part to any new topical products. 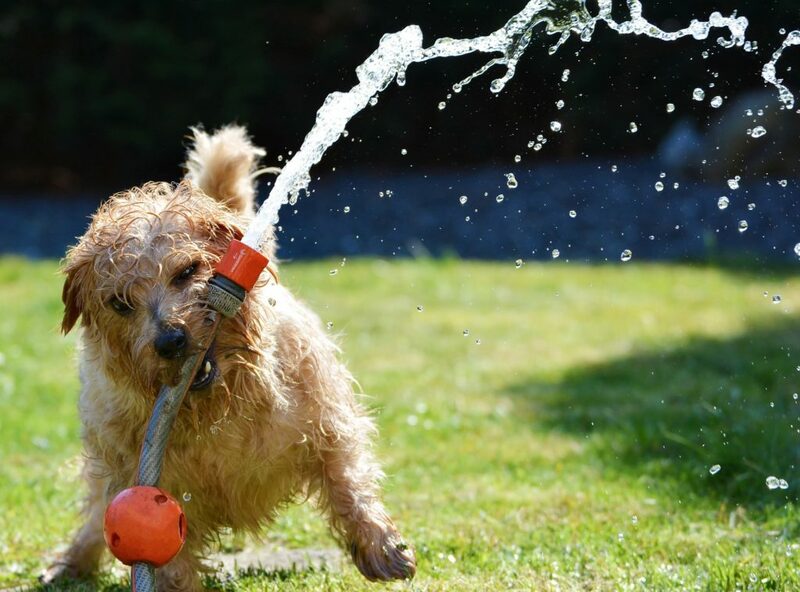 Do you rush through dog bathing because you and your pet dislike the process? You’re probably leaving behind tons of debris and bacteria. In fact, the wet dog smell that frustrates you might just be the result of poor grooming. Next time you wash your dog, comprehensively bathe all the areas that are most likely to get stinky, including the hindquarters and between the toes on the paws. That way, when he’s drying out, you shouldn’t notice the same level of foul odors. Trying to keep the wet dog smell out of your household might seem like a faraway dream, but it’s closer than you think! Just take these hints to heart and have a better bathing result with your pup.